Let me just say that having grown up in Texas, I’m a big fan of rodeos. I grew up on small town rodeos in west Texas – mostly Weatherford – and always loved the gaudy western wear, calf roping and barrel racing (not so much the bull riding) and especially rodeo clowns. Rodeo clowns aside (theirs is actually one of the more dangerous jobs, as they’re distracting bucking bulls and broncos away from fallen competitors), the Charros de Ex-Hacienda de la Soledad, just southwest of Oaxaca City, offered all that and more on Sunday, plus chicas in full skirts galloping sidesaddle, traditional dancing (OK, one couple) and a mounted crooner in full charro suit. A charro event isn’t exactly a Texas rodeo, but close enough: it’s a little rough and rowdy and a whole lot of spectacle in fancy western wear with cowboy boots. My landlady, Luz, was selling advance tickets last week – turns out she comes from a charro family and this was to be their first-ever public exhibition as a fundraiser. Tickets were $60 pesos each, or about $3 U.S., so nothing to lose. Even with a map, though, it turned out to be a three-times-asking-directions trip up past the Juárez monument, down the San Lorenzo road past the greenhouses, and down three more dirt roads to a small arena. Which, just like in Texas, featured advertising on the fence by Purina. Luz was already there selling sweet breads, and a modest clutch of side diversions included food and drink vendors – including one food truck selling pork and fish tacos — typical cotton clothing and tablecloths and a tiny jumping house. 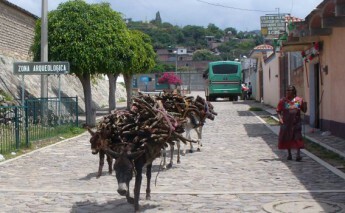 Charrerías – loosely rodeos – evolved in Mexico as ranchhands held contests among themselves to show off necessary working skills such as bronco riding and calf roping. Prior to the Mexican revolution of 1910, the distinctive charro suit with its tight trousers, embroidered jacket and fancy sombrero, was worn only by affluent upper class Spaniards on social occasions, especially on horseback. Now the rodeo skills are matched by the spectacle and clothes; throw in song, dance, food and mezcal and it’s another excuse to have fun on a Sunday afternoon. The flyer said the charrería started at 2, so getting there at 3 was perfect timing for the entry parade – first eight chicas in fantastic full skirts of every color, followed by eight caballeros in chaps and sombreros. The youngest of the chicas looked to be about 10 years old; they were all waving and smiling and showing off a bit of fancy boots under those full skirts. And riding side saddle, no less. Since horsemanship is not part of my normal world here in Oaxaca, I had to ask about specific vocabulary. A bit – that piece of metal that goes in the horse’s mouth and is attached to the reins to direct it – is called a freno, or brake, just like on a car. A saddle is just a silla, the same word as chair, though sometimes called a silla de montar, mounted chair. Spurs are espuelas, reins reindas, no fancy translations there. The actual events were modest in size, but fairly impressive in their scope. There was fanfare in the opening spectacle with galloping in formation, though strictly segregated into men’s and women’s groupings. There was calf and bronco roping, two of the more impressive and active events. One lone bull rider and a fairly languid small toro; I’m pretty sure he didn’t get in his six seconds. Lariat skills, even one vaquero who stood atop his horse to spin the rope. One dance number. And possibly the most popular event, a mounted singing charro in full embroidered suit, floppy tie and sombrero who led the crowd in popular songs, including one of my favorites, El Cielo Rojo (lyrics below: another sad, romantic Mexican love song of longing and unrequited love). And of course, Cielito Lindo, which we of a certain age from el Norte will forever remember as the “Frito Bandito” song — he was the politically incorrect cartoon mascot of Frito’s cornchips from 1967 to 1971. (“Ay, ay, ay, ay; I am the Frito Bandito. I like Frito’s cornchips, I love them, I do. I want Fritos corn chips; I’ll get them from you.”) His broken English and Frito-robbing ways eventually spurred his retirement from pressure by the National Mexican-American Anti-Defamation Committee among others. Sad to say things haven’t advanced much there. It turned out that the dapper elderly charro (who actually answered a cell phone call while astride his horse in the arena), was Luz’s dad and who looked strikingly like my own dad albeit with a mustache (though Ray Bean never in his life except in the Army calvary wore any hat but a baseball cap). Pushing or possibly past 80, he was commanding in his charro suit, mezcal in hand, chatting up the ladies and kissing babies after the show’s conclusion. After the three-hour event ended, no one rushed off (except the cowboys, who loaded the horses into low trailers and took off down the dirt road); there was still plenty of food and drink and a nice stretch of Sunday afternoon with remarkably, no rain this afternoon at the start of rainy season. The homemade rompope ice cream (made with a sort of egg-noggy liqueur) had run out, but there was still coconut, leche quemada (literally burned milk), tuna (prickly pear cactus fruit) and tejate (with the flavor of the corn-based foamy drink of the same name). We ate the picnic lunch we’d brought at tables under the tent, sampled ice cream, chatted with Luz’s charro-suited dad, and wondered about the youngest cowgirl’s brown hair, fair skin and blue eyes. Like the whole charrarería, a parting gift from the Spaniards, made better by the Mexicans. Loved your report. Btw, I’ve photographed the father of Luz many times during the Día de la Independencia parade — the charros are my favorite contingent! They always bring back memories of rodeos I attended in my childhood.